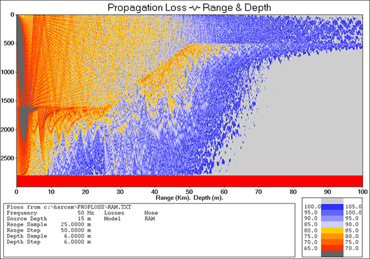 A Sonar Range Prediction System for research and detailed acoustic analysis. The HODGSON And RAM Composite Acoustic Model – HARCAM – is a dedicated propagation loss system designed to produce accurate acoustic propagation loss data over a very wide frequency band – from 10Hz to over 500kHz. All data input and output is based on ASCII text files with one variant producing simple, common theme, graphical output suitable for quality control and logging purposes. It is aimed at users who need to produce large quantities of propagation loss data, in an efficient manner and ideally using a computer that can run unattended. This makes HARCAM particularly suited to users involved in underwater acoustics research and environmental impact assessment. HARCAM is supplied with the same supporting data sets as WADER. 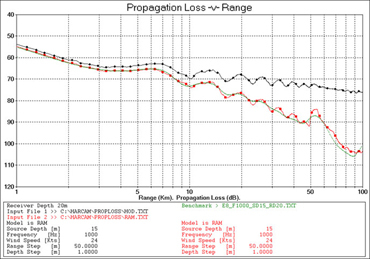 A unique feature of HARCAM is that it uses two models, HODGSON and RAM, to produce accurate propagation loss data at high and low frequencies respectively. In addition, it utilises HODGSON to provide surface and absorption loss data to correct RAM output in the 250-1000Hz range where these parameters are important and where RAM is unable to include the effect of sea surface and absorption losses. In essence the two models form a symbiotic relationship to produce accurate, consistent propagation loss data from a single user interface over a frequency band that covers all operational sonars. *Data availability is limited in littoral waters however a facility exists for users to input their own additional high-resolution data if available. Available now to lease on a weekly basis. All data inputs are in ASCII format. The system is configured to allow a large number of individual propagation loss calculations (10,000) to be completed using a single set of input files. The system can provide a set of graphical outputs – ray trace, PODgrams (Probability of Detection diagrams) and propagation loss curves – but the primary output mechanism is ASCII for downstream processing. A Probability Of Detection diagram (PODgram) provides an efficient way to assess detection ranges against target depths between the surface and seabed on a single display. In this example sound is propagating upslope and the display has been adjusted to show propagation into the seabed – not normally important for target range prediction purposes but useful for teaching. HARCAM uses a unique process to include sea surface and absorption losses in the low frequency model, RAM. This process allows RAM to be used at a higher frequency than would normally be possible – in this case, 1000Hz. This example shows a comparison between the benchmark result and RAM. The black curve is RAM without sea surface loss and absorption loss correction while the red curve is RAM with these corrections included. Agreement with the benchmark in green is excellent. OAD does not have a product brochure for HARCAM but excerpts of the user manual can be made available for interested users. Please contact us for details.